A Massachusetts retiree with a knack for discovering secrets lands a new gig. Jane Darrowfield, who has a reputation among her friends as a problem-solver, is offered a job at Walden Spring, an adult community in Concord. But director Paul Peavey is evasive about what exactly the job involves. When Jane, at his suggestion, moves into an apartment pretending to be a potential long-term resident, she sees that Walden Spring has rival cliques, just like high school. Because she’s already met Evangeline Murray, a friend of a friend, Jane lunches with the artists. The leather-jacketed bad boys are led by Mike Witkowski and the popular preppies by Bill Finnerty, whose wife is in the Alzheimer’s unit. At the same time, Jane, who’s vetting men from a dating site for a friend, finds herself drawn to Harry Welch and agreeing to another date after years of wariness ever since her husband took off with another woman and most of their money, leaving her to climb back to financial security on her own. Jane soon discovers disturbing undercurrents at beautiful Walden Spring, especially between Bill and Mike. 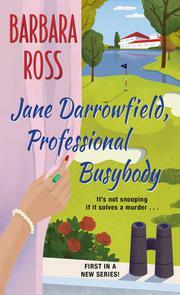 When Bill’s found beaten to death on the golf course, Jane’s ready to go home. Since Peavey and the police prefer that she stay, she decides to do a little snooping. She’s especially interested in the identity of a man she’s seen walking across the community’s golf course late at night. The case takes an unexpected turn with the discovery that Bill and Mary Finnerty were killed in a car crash 12 years ago. So who are the residents passing as Bill and Mary? A sprightly new cozy series for Ross (Steamed Open, 2018, etc.) with plenty of entertaining characters, hidden clues, and a touch of romance.